On arriving in the country, visitors on vacation can stay at the hotel, enjoy San Jose and relax and acclimate a bit before leaving to explore Costa Rica. At the end of the trip, before leaving the country, they stay again with for the last night(s) and enjoy some last minute shopping or San Jose’s varied nightlife. Rincon de San Jose Hotel is located in historic Barrio Otoya, a very pleasant and quiet neighborhood with colonial buildings, in the center of San Jose. A few minutes stroll through nice parks and quiet streets will take you to the real heart of San Jose. There you will find the main attractions, such as the Gold and Jade museums, National Theater, shopping district, restaurants, casinos, bars, etc. 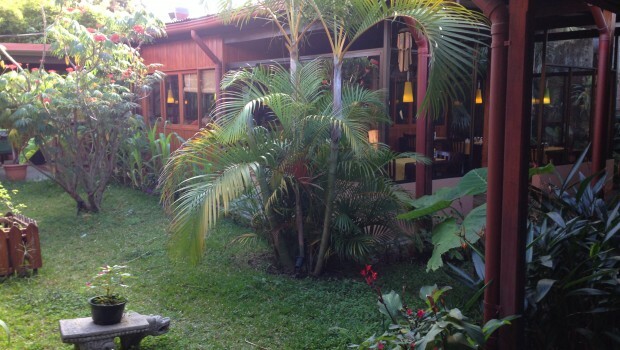 The hotel, with a personal and tropical atmosphere, offers a convenient home base for your business or vacation trip in Costa Rica. If visiting San Jose on business, the hotel offers you a quiet comfortable place to stay. Taxis are readily available and the airport is just 20 minutes away. An apartment is also available for extended stays. Since January 2003, the hotel has a Dutch owner. A new owner, a new name, a new exterior look and some interior remodeling, makes the hotel even more attractive than it already was. The famous decoration of the hotel, with a unique blend of native hardwood and hand carved doors, is of course still intact, and offers a very cozy atmosphere. There are rooms available with or without television. In the tropical breakfast area, there is a buffet breakfast is offered between 6.00 am and 10.00 am. At the end of the day, guests can have a nice drink in the patio bar.